Little, Brown and Company, 9780316261357, 368pp. From a Pulitzer Prize and National Book Award finalist, a ferociously intimate story of a family facing the ultimate question: how far will we go to save the people we love the most? When Margaret's fiancé, John, is hospitalized for depression in 1960s London, she faces a choice: carry on with their plans despite what she now knows of his condition, or back away from the suffering it may bring her. She decides to marry him. Imagine Me Gone is the unforgettable story of what unfolds from this act of love and faith. At the heart of it is their eldest son, Michael, a brilliant, anxious music fanatic who makes sense of the world through parody. Over the span of decades, his younger siblings -- the savvy and responsible Celia and the ambitious and tightly controlled Alec -- struggle along with their mother to care for Michael's increasingly troubled and precarious existence. Told in alternating points of view by all five members of the family, this searing, gut-wrenching, and yet frequently hilarious novel brings alive with remarkable depth and poignancy the love of a mother for her children, the often inescapable devotion siblings feel toward one another, and the legacy of a father's pain in the life of a family. With his striking emotional precision and lively, inventive language, Adam Haslett has given us something rare: a novel with the power to change how we see the most important people in our lives. Adam Haslett is the author of the short story collection You Are Not a Stranger Here, which was a Pulitzer Prize and National Book Award finalist, and the novel Union Atlantic, winner of the Lambda Literary Award and shortlisted for the Commonwealth Prize. His books have been translated into eighteen languages, and he has received the Berlin Prize from the American Academy in Berlin, the PEN/Malamud Award, and fellowships from the Guggenheim and Rockefeller Foundations. He lives in New York City. "Haslett is one of the country's most talented writers, equipped with a sixth sense for characterization and a limber, unpretentious style. Perhaps his rarest gift is the apprehension of the invisible connections that tie people together...The chapters seamlessly negotiate the passage of time...[Oldest son] Michael comes to dominate the narrative, and Haslett perfectly captures the qualities that make him both seductive and infuriating. He is a motormouth with a fitful imagination and a wicked sense of humor; his nervous energy and 'ceaseless brain' are the battery power on which the whole family runs...Haslett is alert to the reality of others, and the insinuating power of this novel comes from its framing of mental illness as a family affair. Michael's siblings are both wholly convincing characters, shaped by the abiding question of how much, or how little, they are meant to act as their brother's keepers...Most affecting of all is Margaret, who is treated with impatience by her children but possesses a capacious understanding...'What do you fear when you fear everything?' Michael wonders. 'Time passing and not passing. Death and life....This being the condition itself: the relentless need to escape a moment that never ends.' That condition, Haslett's superb novel shows, is an irreducible part of the fabric of Michael's family, as true and defining as the love that binds them." "Ambitious and stirring . 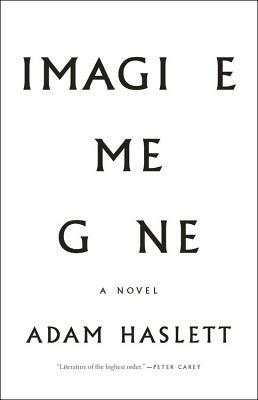 . . With Imagine Me Gone, Haslett has reached another level, affording readers a full and luminous depiction of a mind under siege . . . By putting the readers in the same position as [oldest son] Michael's family members, Haslett has pulled off something of a brilliant trick: We feel precisely what they feel-the frustration, the protectiveness, the hope and fear and, yes, the obligation. If Michael is on the page, if his thoughts or actions are laid bare, there's a grueling sense of dread. If he's out of sight, if his thinking and whereabouts are unknown, the dread becomes all but unbearable . . . This is a book refreshingly replete with surprise. It sneaks up on you with dark and winning humor, poignant tenderness, and sentences so astute that they lift the spirit even when they're awfully, awfully sad . . . But make no mistake, the novel's most rewarding surprise is its heart. Again and again, the characters subtly assert that despite the expense of empathy and the predictable disappointment of love, our tendency to care for one another is warranted . . . Even when it's difficult or terrifying or impossible, especially when it's impossible, the impulse to calm those we hold dear is an absolute privilege." "Imagine Me Gone brilliantly captures the excruciating burden of love and the role it plays in both our survival and our destruction. Haslett suspends a sense of dread over you like an anvil from page one, cutting the rope that holds it in the brutal last act. You'd be a fool to look away." "Drawing vivid scenes and compelling characters from a tragic realism, Haslett intimately connects the reader to his characters' inner lives . . . A rare, complex story [with] exceptional storytelling and poignant insights [and] uplifting moments of humor, kindness, and love." "Smart and polyphonic...Haslett is that rare writer whose art can console without ceasing to be art." "Haslett's second novel is a potent tale of love and loss . . . By its heartbreaking conclusion, we've come to know intimately the joys and struggles of each member of this troubled family." "An ambitious book about music, anxiety, and a family determined to stick together after fracturing loss, Imagine Me Gone is proof that realistic stories have immense power." "There are some books, and this is one, that grab you in the first paragraphs and don't let go, even when the last page has been read. Haslett is certainly not the first novelist to broach the topic of depression...But he's done so with such a fresh voice and playfulness of form...that the resulting novel begs a reevaluation of how we view and cope with tragedy." "Michael is an exceptional character...Haslett is especially adept at depicting the obsessive male psyche in the midst of a meltdown. But as this is also a series of deft vignettes of paternal, maternal and filial love, you too will likely be moved to recall your family with a new fondness and understanding. "A moving novel about how love and frustration shape the family dynamics of those affected by psychological instability . . . [Oldest son] Michael emerges endearingly precocious and quirky, recalling the children of J. D. Salinger's short stories . . . Imagine Me Gone is a character novel to be savored for its complex and empathetic portrait of family. Michael is a compelling character, witty and heartbreaking. This is not a novel driven by plot but by its relentless tides of sorrow and hope. Like his family, you'll soon see the inevitable end but only read faster as it hurtles closer." "Stunning...Beautifully written and filled with astonishing insight...Imagine Me Gone fulfills its considerable ambitions. It touches greatness, and its seamless interleaving of the deeply personal with the widely collective is one reason...Haslett's particular talent is to fuse the high to the low, the sardonic to the profound, cultural critique to human feeling, to achieve a seamless, polished whole. Imagine Me Gone accomplishes a complex feat." "Haslett deftly explores the many different shapes and forms that depression can...his strength lies in encapsulating the darkness that enshrouds the main characters' brains by making tangible the hopelessness that depression often induces in its victims...Imagine Me Gone paints a brand new, innovative picture of depression that demands to be felt." "(A) skilfully written and harrowing tale. Any reader dealing with mental illness in the family will immediately recognise the place where love and obligation meet constant anxiety and intermittent despair. This novel plants its flag somewhere in the middle ground between Jonathan Franzen's The Corrections and Eugene O'Neill's Long Day's Journey into Night." "Haslett has already produced a quiveringly sensitive body of work that stands as a moving testament to the persistence of love in the face of the adversities occasioned by diseases of the brain -- a love personified in Imagine Me Gone by Margaret, who learns of John's condition during their engagement but marries him anyway, and by Alec, who is all too aware of Michael's increasingly precarious state of mind but longs to save him... With his crystalline sentences and uncanny knack for inhabiting the minds of his characters, channeling their distinct voices with the otherworldly insight of a spiritual medium, Haslett has become a master." "The quality of Haslett's character portrayals, his language, and his scene construction in Imagine Me Gone are apparent enough, but the way you know this book is going to stick around for a while is that not one word is wasted." "Breathtaking....Imagine Me Gone glides over unfathomable depths of feeling. Haslett does the tough work of affirming love, while acknowledging that some wounds run too deep for love alone to heal." "For all its elegiac tone, one of the most striking features of Imagine Me Gone is the wicked humor that surfaces in portions of Michael's narrative. Whether he's describing a nightmarish transatlantic crossing or recounting a group counseling session, he's skilled at skewering life's absurdities with sharp wit. For all the darkness that swirls around him, his winning personality makes him the novel's most appealing character." "Haslett narrates this soaring, heartrending novel from the revolving points of view of each family member, plumbing the psychologies of his characters. The result is a polyphonic page-turner that slowly reveals its orbit around Michael, the eldest son. Michael's troubled psyche, an inheritance from his father, proves to be the troubling linchpin at the center of this intensely personal work." "[Imagine Me Gone] shifts confidently between heartbreak and cathartic laughter...with a calm, forensic mastery. "—Wall Street Journal "20 Books that Defined Our Year"
"At once the most beautifully written and yet most harrowing novel of the year so far....Imagine Me Gone is that rare thing in fiction: a book that breathes fresh life into the oldest story of all, that of the dysfunctional family, and invests it with a powerful sense of the love that binds such families together, for good and ill."
"This book is tragic, no question - but it's also poignant, tender and funny." "Succeeds on just about every level that a book can...It's a stunning novel, written with compassion, and it ends where it has to-Haslett is a fearless writer, refreshingly unafraid to confront darkness. That's not to say there's no light in Imagine Me Gone; it is, in the end, a book about love and about survival. And it's unquestionably one of the truest and most beautiful novels of 2016."